..the server was having hard time recovering from being down several minutes long. Not very much but every once in a while.. And h4s is down and from list for about 5 minutes. Ofcourse it's sad to have just half of the people back afterwards.  So from the amount of players around these events I'm pretty sure it's a server attack/reboot or something like that. Do you guys have it too? What is it? Any1 wants to check the log for it? Yesterday okt 5, locally 9:05 pm.. I dont have it. And since Im not at home I cant check the logs. It didn't get down at 5 oct, thats sure, the server uptime is way longer and theres nothing in the log o0. And 1 min back only server missing from list is h4s. Refresh, Get new, Refresh, Get new, restart wolf.. Still no h4s. That's weird. Only h4s gone while I see it's online on GT.. Anyone an idea? Some times I have hard time getting response from the server (ping it) with xfire but its not going down or anything, strange. Sure but I want all working 100%, h4s-Captain_Ali! @ Whatever: nothing can work 100% fine in a heavily patched game. Not even are all webserverlists alike. The best is L0's. @ Whatever: nothing can work 100% fine in a heavily patched game. Tnx for your help Pinkfloyd, but 1.0 is not patched right.. Besides that, all RtCW 1.0 install packs/copies that were provided online last few years seem 100% okay, except for maybe needing the masterpatch and only pb if you want. And best list is l0's? Why is that? I never heard of wolfmp/s4ndmod being unreliable on their serverlist? Anyway I want my list in the game, not in my webbrowser. have just half of the people back afterwards. Nothing about that in log? All left the exact minute? Mhm, redirecting url's is nothing that complicated, just there are different redirections and different executables too. About h4s, I noticed some people cannot ping it since weeks, meaning they cannot even enter, I'll look into it. Some people dont find h4s since weeks? wtf?? There arent any other servers around. All are in the new master list as I know. You dont have to report the ip to anybody. It update itself. Like the original master list did. Servers are automatically in. When I had my addicted rtcw time and played more then now, I also disconnect from server maybe once a month. But not more. And it was always back directly and I could connect. You were connected 24/7? Wow.. Suggestions still welcome. Tnx so far all. Don't think so, to appear on the alternative list, a server must have sv_master set to the new url in the cfg, meaning server owners etc have to do it. And its not just one list, for example FF (the goldrush clan) has their own. Well not, hosters need only to add the new url in the cfg, the bigger problem is that clients must download a new executable. FF took it offline if I'm right. Seems they were 1 of 3 that offered an alternative master (patch). Now remaining deathmask/WolfMP and s4ndmod as only two afaik..